The last time I was in Hougang, I was 14 years old and the bubble tea craze was strong. My memories of Hougang revolve around buying instant cup noodles from the neighbourhood 7-11 and sipping on blueberry milk tea while waiting for my after school activities to start. So, you must forgive me if I say that I do not have many vivid gastronomical memories of Hougang. I chanced upon an instagram post by The Singapore Women’s Weekly on some delicious looking banana pancakes and decided to try my luck and find out if Flavour Flings was halal-certified. A few email exchanges later, I learned that they were not halal-certified but were partially Muslim-owned. Flavour Flings is just shy of turning two months old. 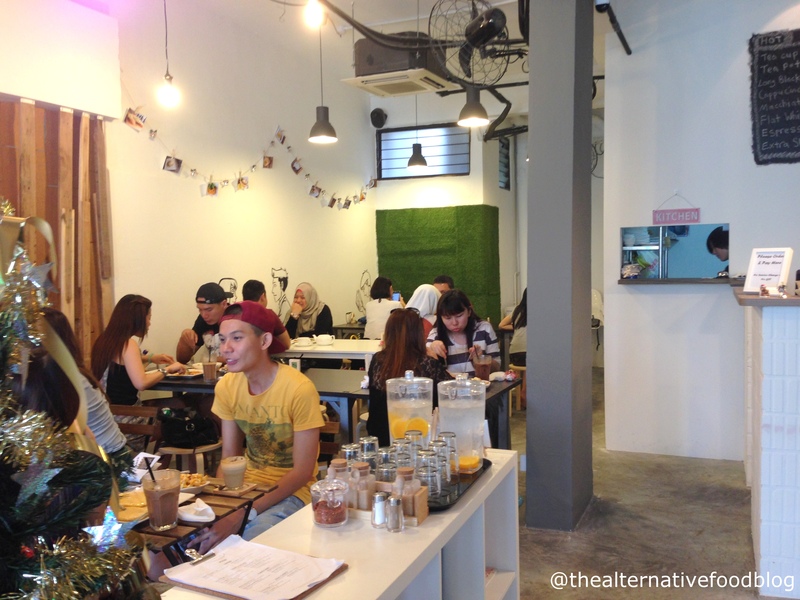 It is co-owned by three individuals and one of the three owners is a Muslim lady. While they are not halal-certified, their owner, Delphine, shared with me that every ingredient used at Flavour Flings is indeed halal-certified and they have a strict no non-halal rule in their kitchen and cafe space in order to ensure that their Muslim patrons feel comfortable and at ease dining within their premises. 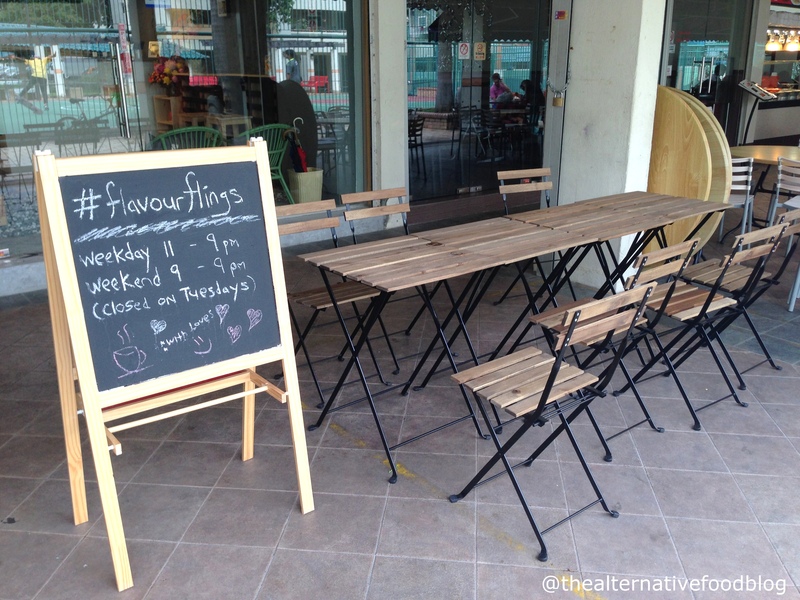 Their premise is situated in a neighbourhood estate in Hougang and can sit up to 30 people comfortably. 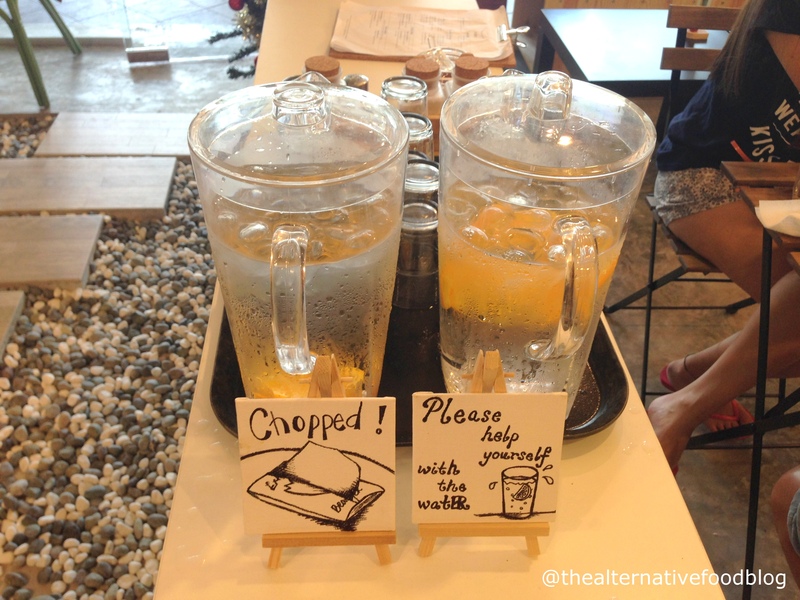 I was very taken by their cafe when we first arrived because of how bright it was. 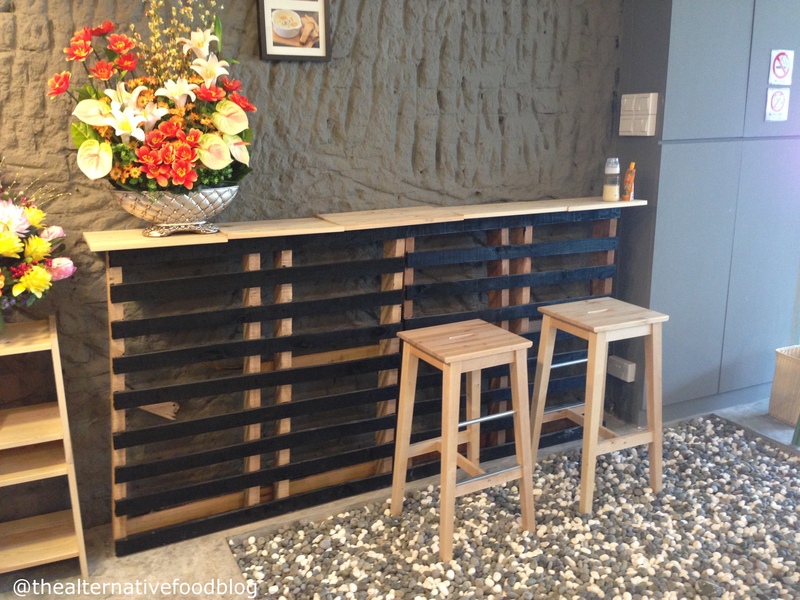 The walls are flushed white in colour and they had glass doors which allowed natural light to shine though the cafe. The cafe is brightly lit with hanging bulbs and my favourite thing about their space is that it is not cramped at all. This means that there is enough space to have comfortable conversation and not have to squeeze with complete strangers. Kit and I got a table at the back and sat down to enjoy our meal of Toast of Brie (SGD $10.00), Marie’s Baked Eggs (SGD $14.00), The Awesome One (SGD $11.00), our side of Ballpark Garlic Fries (SGD $7.00) and our dessert of profiteroles (SGD $8.00). You’ll notice that the dishes we ordered this time around are all ovo-lacto vegetarian friendly because I wanted to be able to share the dishes with Kit. 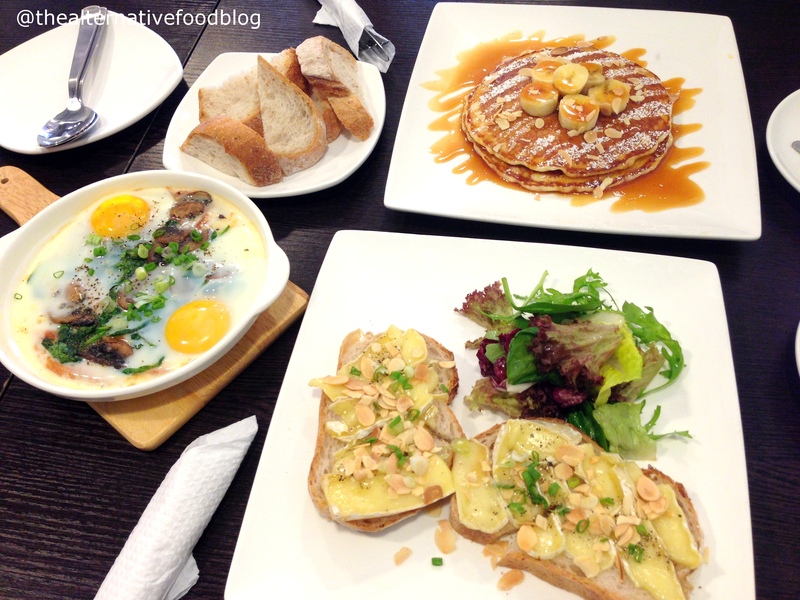 Of all our mains, I have to say that our pancakes order (The Awesome One) and toast with brie would be my two favourite dishes. The former is a stack of two pancakes with salted caramel sauce and bananas while the latter consists of two slices of french bread with truffle honey, brie cheese, and slithers of almonds. 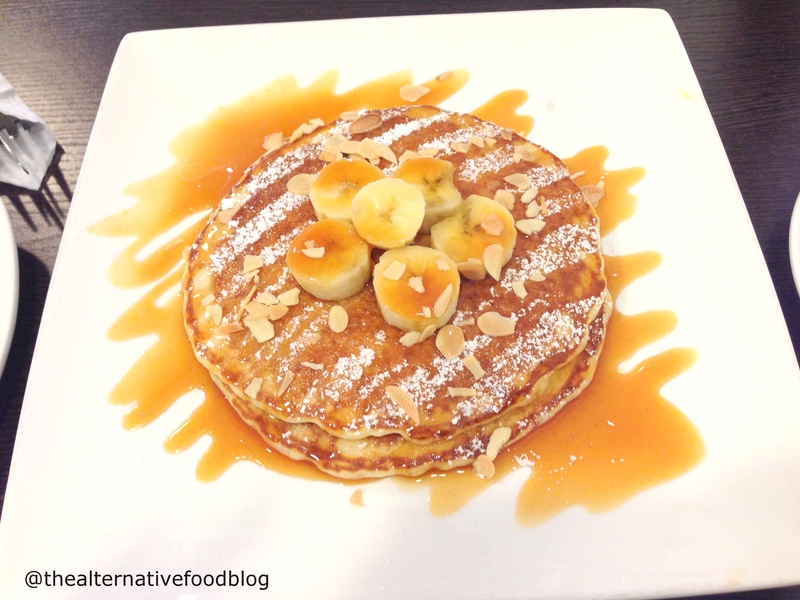 We previously reviewed pancakes from The Bravery as well as from Sarah’s the Pancake Cafe so we were really curious to see how Flavour Fling’s pancakes fared in comparison to the other two. Thankfully, their pancakes did not disappoint. I loved how light and fluffy the pancakes were. They were interestingly enough, slightly crispy on the outside and so soft and fluffy on the inside which made my heart sing. It was definitely worth the money. We later learned from Delphine that the pancakes are actually the chef’s specialty and that was definitely evident in the taste of the pancakes. I will admit that I did find the sauce sweet and with the pancakes bathing in the sauce, it could be overpowering for some people. The next time I order this (which I will for sure), I’ll be certain to request for sauce on the side so that I could enjoy the pancakes both with and without the sauce. The Toast of Brie is unlike anything I’ve ever tasted and includes the addition of truffle honey to the toast. As its name suggests, this is a toasted bread dish with a generous serving of brie cheese, covered with toasted almonds and a drizzle of truffle honey. At first glance, paying $10 for this dish, which Delphine informed us was meant to be an appetizer, might raise some eyebrows but I do believe that the ingredients used in this dish are not your run of the mill ingredients (i.e. 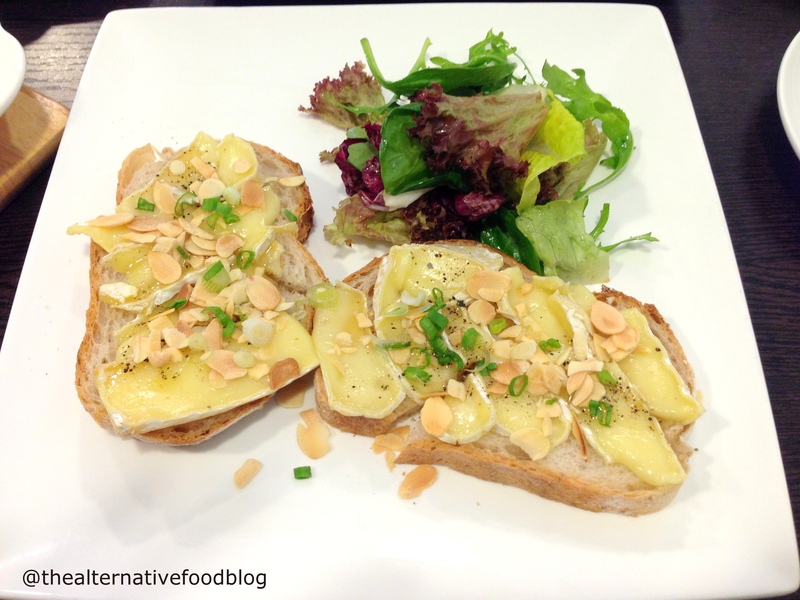 brie cheese, truffle honey…) so perhaps, that would make you feel better about paying that much for toast. When I first sank my teeth into the dish, I couldn’t quite wrap my head around the taste of the dish. The cheese wasn’t overly strong but there was a certain subtle, earthy sweetness that came from the honey which took me a while to get used to. It was the first time I was trying truffle honey so, I really didn’t know what to expect. It was also garnished with spring onions and served with a side of salad. I thought the spring onions was a little strange at first but the combination of the honey, the spring onions and the brie cheese worked well for me. It isn’t a familiar taste to the palate and I maintain that it is an acquired taste but I think it is something that will grow on you. 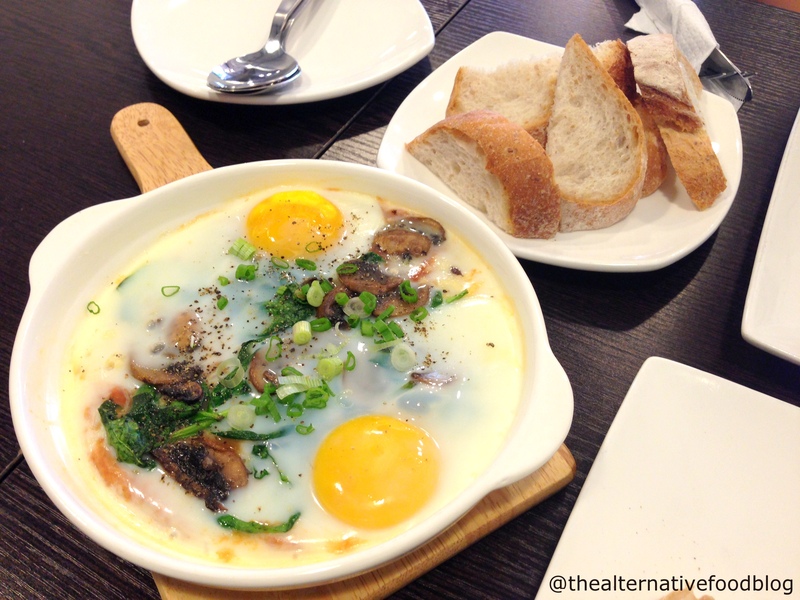 We also ordered a serving of Marie’s Baked Eggs which is similar to a shakshuka dish. It consists of similar elements such as the tomato based sauce and baked eggs but in my opinion, it wasn’t as herby as the mediterranean dish usually is. 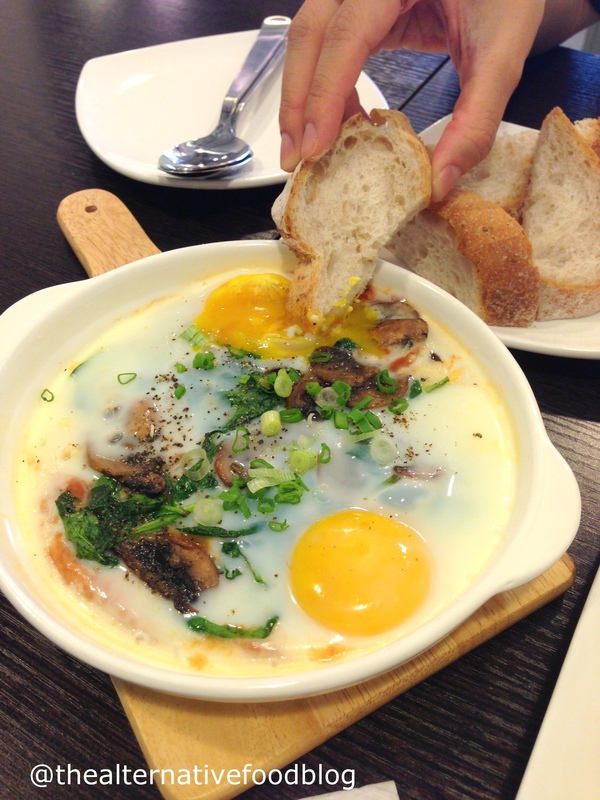 We opted for the vegetarian option of baked eggs, with spinach and mushrooms and Kit really liked how light the whole dish was. I was surprised at how thin the sauce was because I’m quite used to thicker sauces but the dish was flawless. From the light well-seasoned sauce to the wonderfully baked eggs, I have no gripes about it. Kit thoroughly enjoyed dipping the fresh bread (which comes with the dish) into the sauce and wiping the dish clean. This dish also ranked very highly on Kit’s list. Since their dishes were all forgiving on the waistline both in terms of portion size and heaviness, we ordered a side of their Ballpark Garlic Fries. As the name suggests, garlic features heavily in this dish so if you’re not a fan of garlic, I would suggest staying away from it. The taste of garlic definitely stands out in this dish but it was tastefully married with chilli. 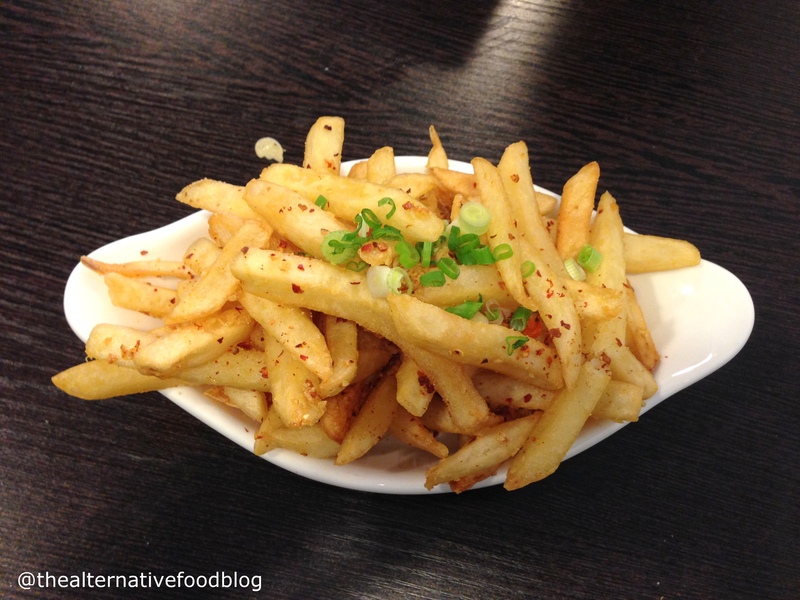 From what I observed, garlic and chilli were probably fried together before tossing it with the fries. This meant that the fries were coated not just with garlic but also with a layer of spiciness. When Kit and I were discussing this dish, we realised that this dish had a very Asian spin to it and would definitely appeal to our spice and garlic lovers. We ended our meal with an order of Profiteroles which is basically three small servings of choux pastry with three servings of ice cream. The choux pastry is made in-house by the chef himself and was so soft, so warm and just so lovely. You get to decide which ice cream flavours you want so Kit chose coconut, salted caramel and Belgian chocolate. Of the three, Kit really liked the Belgian chocolate flavour while I preferred the coconut. While Kit’s Belgian chocolate was so flavourful and strong, mine was more subtle but was still so flavourful. 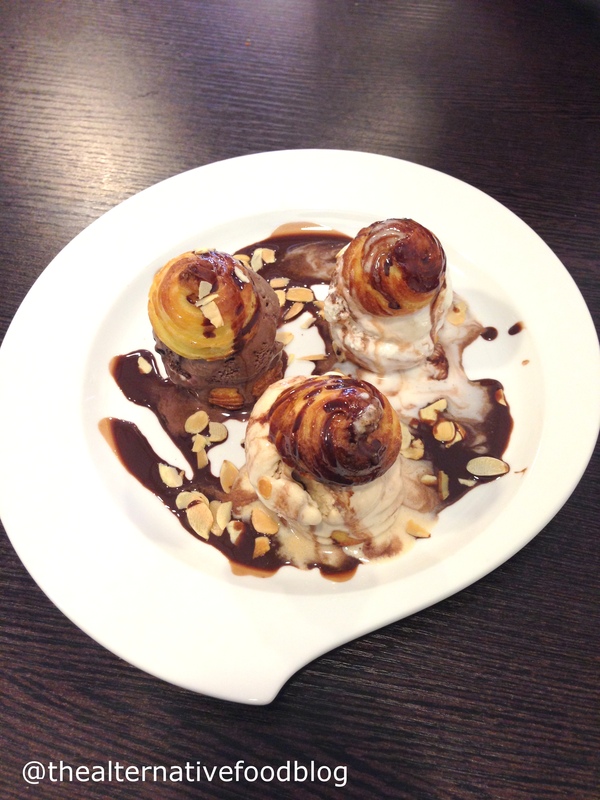 Delphine also shared with us that her personal favourite flavours were the coconut and Belgian chocolate as well. Kit ordered her usual Cappuccino (SGD $5.00) while I decided to have myself a Tea by the Pot (SGD $7.00) and opted for the English Breakfast Tea. I thought that my tea had been steeped to just the right amount of time so my tea was light, sweet even without sugar, and left me with no bitter after taste. I thought their pot size for the EBT was big – thus leaving me with more tea than I could finish. 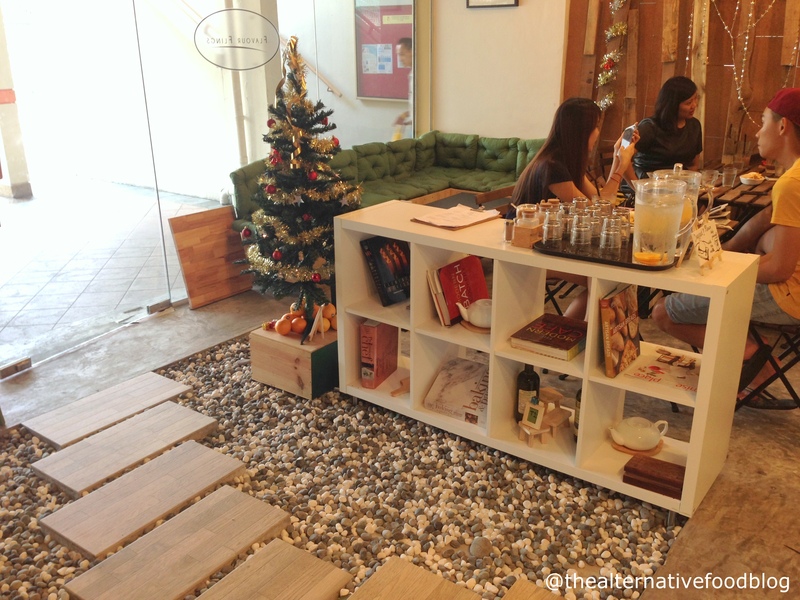 I am really glad that cafes seem to be moving away from the hipster crowds like Arab Street and Tiong Bahru and setting up residence, instead, in heartland areas like Hougang. 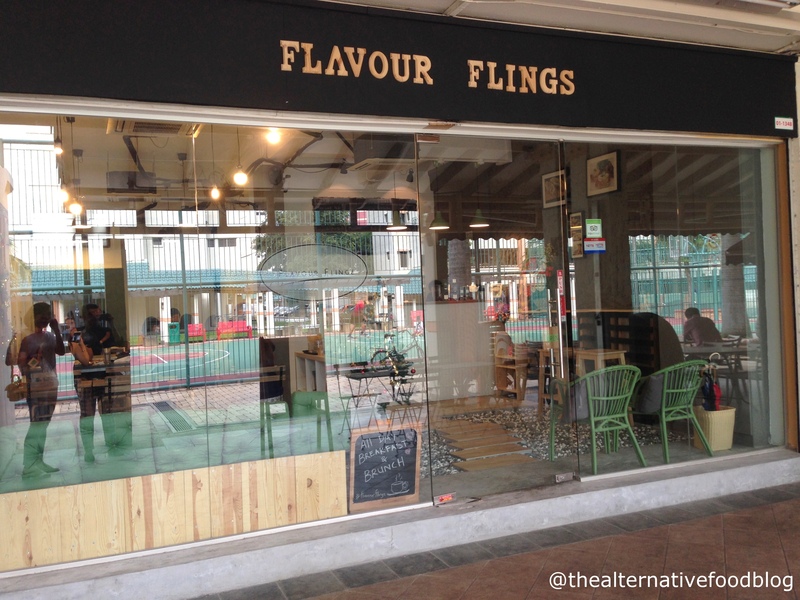 I’m even more glad that a cafe like Flavour Flings now exists in the North. The East and West have already so many stellar cafes that it was time the universe brought one to the North. 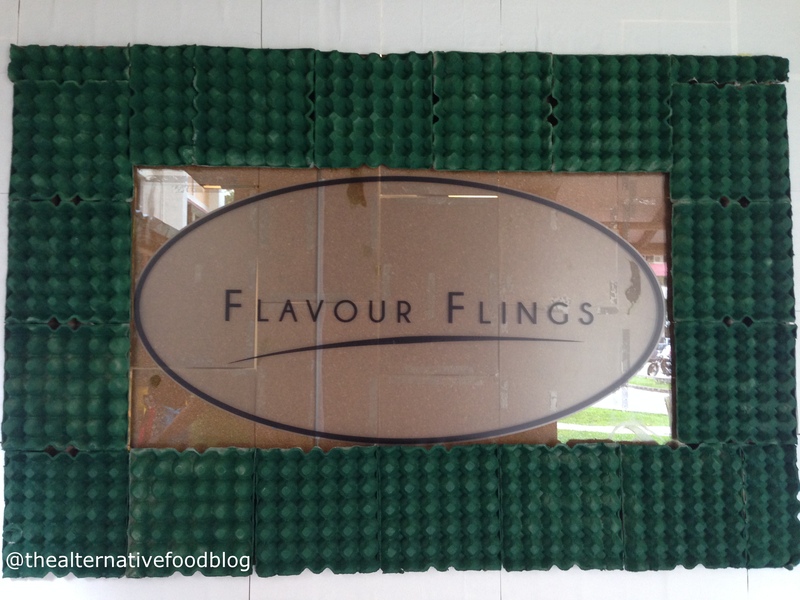 It is without any hesitation that I say I am looking forward to my next visit to Flavour Flings to try more of their creations. Halal Status: Part Muslim Owned. Vegetarian Options: Available for ovo-lacto vegetarians. Our Ratings: ♡ ♡ ♡♡ / ♡ ♡ ♡ ♡ ♡ (4 out of 5 hearts).